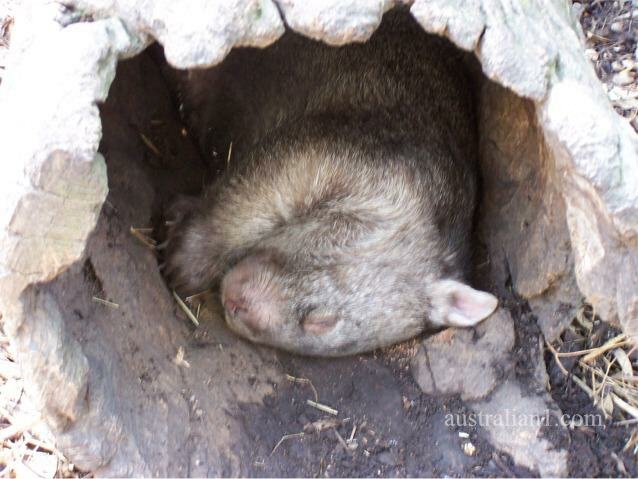 Common Wombat - (Vombatus Ursinus). 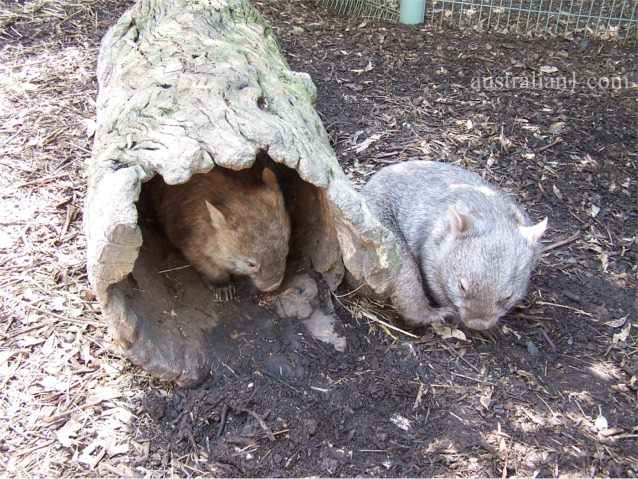 These wombats were photographed at the Featherdale Wildlife Park outside Sydney Australia in October 2004. Habitat: Sclerophyll forest usually 300 m above sea level but will also live in dense scrub. Breeding: Will breed any time of the year, one young at a time, the young live in a pouch for 6 months. General Information: Although nocturnal, often grazes during the day. The Wombat is an Australian marsupial, in appearance rather like a small, very short-legged and muscular bear. It may look like a bear, but it behaves more like a badger. Wombats feed on grasses, sedges and roots, and dig extensive burrow systems with their rodent-like front teeth and powerful claws. Although mainly crepuscular and nocturnal, wombats will also venture out to feed on cool or overcast days. They are not as easily seen as many animals, but leave ample evidence of their passage, treating fences as a minor inconvenience to be gone through or under. Wombats, like all the larger living marsupials, are part of the Diprotodontia, which has two sub-orders: the large and diverse Phalangerida (kangaroos, possums, and relatives), and the Vombatiformes (which is the Latin for "wombat-shaped things"). Five of the seven known families are extinct, only the koala and the three species of wombat survive. The ancestors of the wombat evolved sometime between 55 and 26 million years ago (no useful fossil record has yet been found for this period) and about 12 species flourished until well into the ice ages. The Diprotodon, or giant wombat, was the largest marsupial to ever live and coexisted with the earliest human inhabitants of Australia. There are three species, all around a metre long and weighing between 20 and 35 kg. The Common Wombat - (Vombatus ursinus) is widespread in the cooler and better watered parts of southern and eastern Australia, and in mountain districts as far north as the south of Queensland, but is declining in Western Victoria and South Australia. Common wombats can breed every two years and produce a single cub, which leaves the pouch after six to nine months but follows the mother about and breast-feeds for another year.